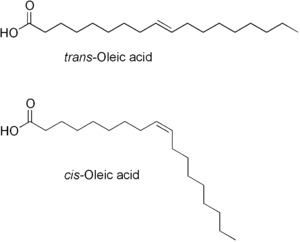 Comparison o the trans isomer Elaidic acid (tap) an the cis isomer oleic acid (bottom). In chemistry, pairteecularly in biochemistry, a fatty acid is a carboxylic acid wi a lang aliphatic tail (chain), which is aither saturatit or unsaturatit. This page wis last eeditit on 15 Februar 2018, at 21:39.